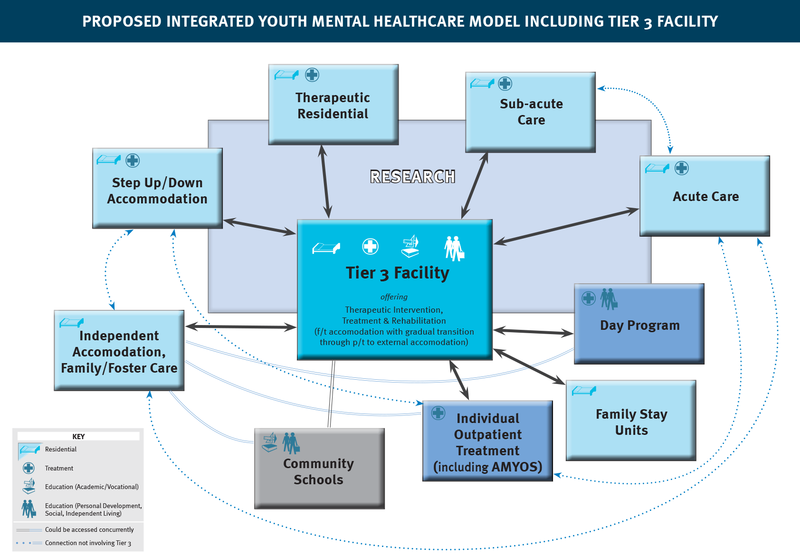 An inpatient extended treatment and rehabilitation service with onsite schooling for adolescents to young adults (adulthood rarely begins at 18 years when mental health issues have hindered social and emotional maturity) must consider some essential factors in order to stimulate positive change in the lives of those affected by severe and complex youth mental health issues. 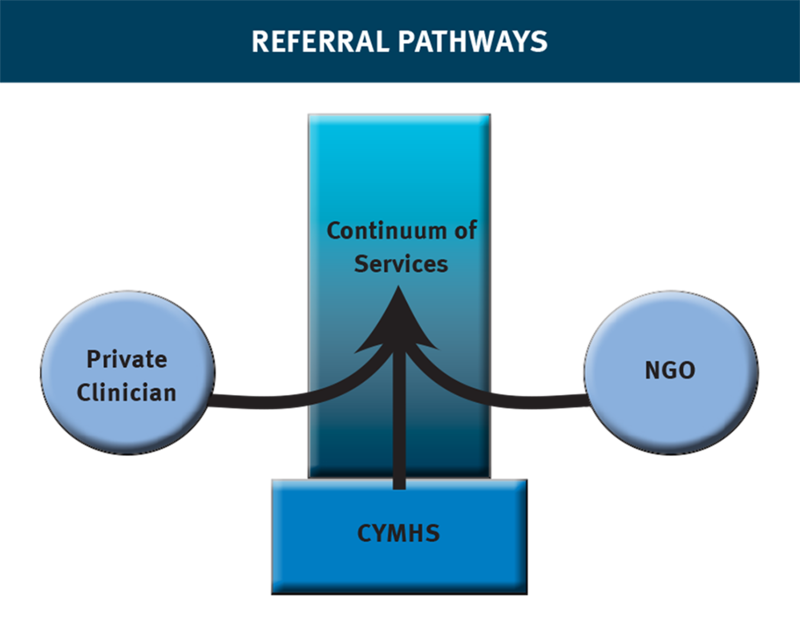 Any new service MUST be an INTEGRATED part of a cohesive full spectrum of services that, on one level, includes a complete continuum of youth mental healthcare where clear referral pathways and transition procedures ensure a young person can move from one service to another in a supported environment where the primary consideration is their stability and progress. 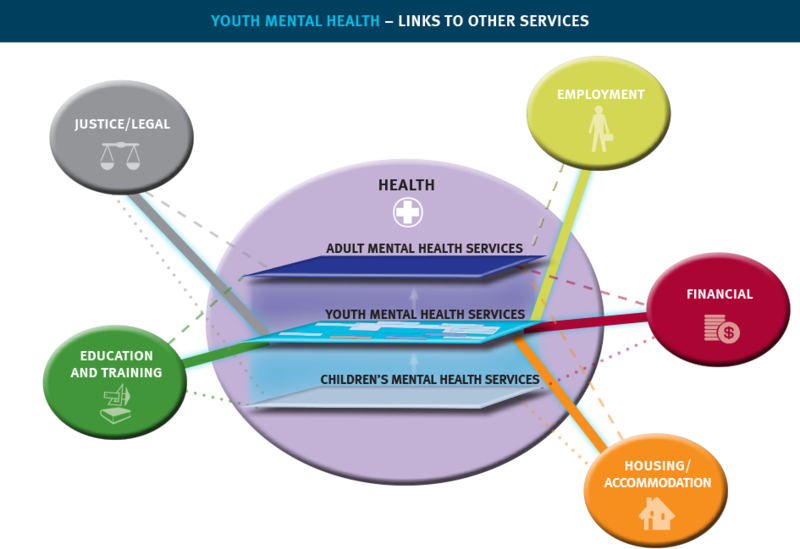 This continuum must also exist within the full range of mental healthcare services (that includes programs specifically for children and for adults); the full range of healthcare services (encompassing all health issues beyond those in the mental health area); AND a full range of services that young people and their families are likely to need i.e. Education & Training, Employment, Financial, Housing & Accommodation; Justice/Legal etc. When the young person – with all their complex needs, unique characteristics and personal goals – is at the centre of the implementation of multiple support mechanisms that are all interconnected, they will finally have the chance to bring their individual efforts, talents and insights to a meaningful adult life. A collaborative multidisciplinary team of professionals (Psychiatrists; Psychologists; Mental Healthcare Nurses; Teachers/Teacher Aides; Occupational Therapists; Social Workers; Administrative, Maintenance and Catering personnel; and visiting/external skilled practitioners) and the adolescents together creates a micro-community that enables young people to observe and form functional relationships in a reassuring environment while they receive personalised therapeutic treatments and have access to a flexible education program. The team approach is the only way to achieve rehabilitation as well as progress in terms of health when so many young people arrive at inpatient extended care with levels of mistrust that are the natural result of experiencing the lack of understanding that is at the heart of a long history of failed interventions. So opportunities to build trust are the foundation of effective therapeutic engagement. While the team is always focused on the objective from the time of admission to transition the young person back to their own community, change can only be affected if it’s enabled first within the smaller scale setting stabilized by understanding and expertly managed flexibility. The centre’s environment of trust and acceptance facilitates the acquisition of resilience, self-esteem and social skills, all of which can be tested and developed in interaction within this safe communal environment before being practised during excursions into the wider community (when those are deemed clinically suitable) and in visits home before and during transition. The respect and cohesion are not confined only to those who are regularly present at the centre. Families/carers can be the best and most undervalued resource when it comes to the mental healthcare options for young people. Whilst it is, unfortunately, sometimes the case that a domestic environment can be a negative factor in the life of a traumatised adolescent, this should never be seen as the default ‘origin story’. Family members of a young person with severe mental health issues should be viewed as an asset and a vital resource until they prove conclusively otherwise. Those clinicians who don’t enter a relationship with a young person with the approach that they are also embarking on a significant and productive relationship with those who care for their patients risk the health of the adolescent as well as the wellbeing of others who have already dedicated huge amounts of time and effort to supporting and sustaining the young person. The people who’ve persisted through years of inappropriate treatment alongside a severely ill adolescent have untold strength and knowledge. Often their expectations have been incrementally lowered and they are all too aware of the reality of the world and what outcomes can be practically achieved. In most cases, all they demand is that professionals bring empathy along with their knowledge to do their best to help a suffering young person. The pressure is not for results but for respect … and the same kind of effort and attitude a specialist would apply to a severely ill infant and his/her family. Few can heal under the cloud of condescension or misconception. However, many will feel able to apply challenging strategies from within a group with a collective goal where pain, effort and misfortune are justly acknowledged. These people – the adolescent and their supporters – deserve to have their hopes raised and then exceeded after the torment they have already been through. This is what the response to Recommendation #4 should be setting as its goal. This could be a new dawn for future generations of Queenslanders. It must not be another piecemeal or rushed offering to acquiesce to legal or political demands. Those who have been lost or irreparably hurt already will forever be reminders of decisions made in haste, ignorance and without the best interests of those in need of help as the focus, the goal, … the entirety of the motivation for every step taken in a new direction. For those who have already been so wronged – by fate; by genetics or environment; or by people who have failed to see that the greatest human strength is kindness. The benefits of our best efforts are the least that we can do.